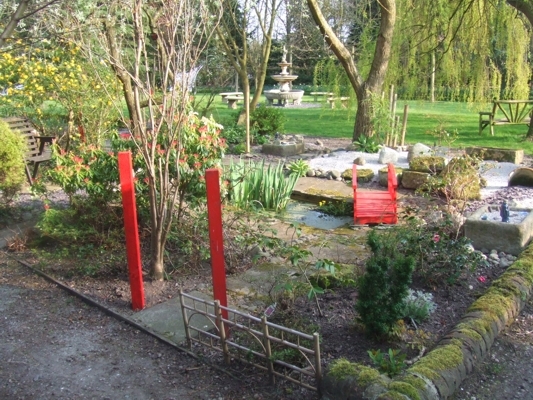 The gardens are open to the public several times a year in aid of various charities, including the National Gardens Scheme, the Samaritans, Cheshire Wildlife Trust, Wirral Hospice St John’s and Neston Rotary Club. The walled gardens are also available for private functions such as weddings, tea parties, musical performances and exhibitions. The parkland consists of a 3.5 acre wildflower meadow enclosed by nearly 400 metres of nine species hedgerow, which links four copses to make a wildlife corridor between two areas of woodland. The nine native species, chosen to provide flowers and fruits and winter cover, are: hawthorn, blackthorn, hazel, alder, dog rose, guelder rose, oak, beech and holly. It is sometimes grazed by rare breed sheep. The hedgerow has been laid by volunteers from Cheshire Wildlife Trust Wirral Branch, with some plants left to grow into trees. The double figure of eight path makes a way through the meadow, when it is grown, and leads to a giant sequoia, a noble fir, a summer house and the four copses, originally planted with elms in Capability Brown fashion, but now home to oaks, beeches and Scots pines. There are still elm suckers, which mostly die, but we live in hope. The woodland is an acre of ornamental beech plantation through which the main drive approaches the west of the house, past stately silver-grey trees underplanted with rhododendron, bay and holly. 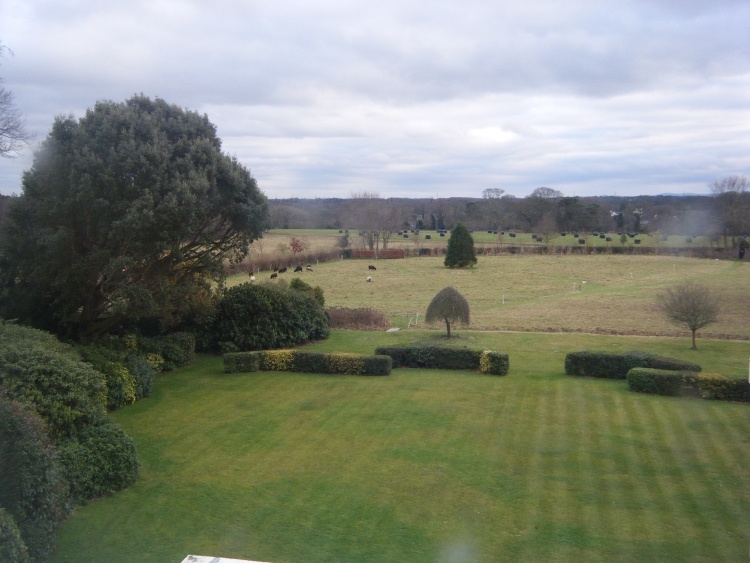 The original gates were sacrificed in the World War and the drive was disused, but the gate posts remained and when Scirard and Caroline came they removed the invasive sycamores which had obliterated the original drive and restored it on a slightly different path. The American novelist Nathaniel Hawthorne, who visited during his time as American consul in Liverpool in the 1850’s, remarked on “the fine lawns and the view of the Welsh hills out across the ha-ha or sunken fence.” On the way to the entrance to the walled gardens are a small pond garden, a small rose garden, and a small fruit and herb garden with their own little shed, compost bins and water butts. The walled gardens were established by Rector Thomas in the mid-nineteenth century, in the popular Victorian “gardenesque” style, introduced by Scottish botanist John Claudius Loudon, who favoured “regularly and symmetry” over the more natural effects created by Lancelot “Capability” Brown. Six main areas with gravel paths could feed and decorate the household, providing fruit, vegetables and flowers. There was a heated wall and an army of gardeners. The entrance to the walled gardens is intended to make you think you are entering a world of make-believe. Roger Lancelyn Green’s works, and those of his friends such as C. S. Lewis and J. R. R. Tolkien, have introduced generations of children (and adults) to imaginary lands and marvellous adventures. 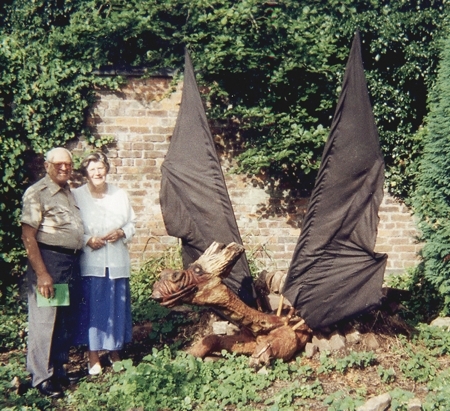 In the southwest corner of the large garden is a wood carving by Jim Heath, The Jabberwock (Alice Through the Looking Glass – Lewis Carroll) which comes “whiffling through the tulgy wood” and sometimes breathes out smoke. Roger Lancelyn Green wrote The Story of Lewis Carroll (1949), edited Lewis Carroll’s diaries and collected letters, founded the Lewis Carroll Society. 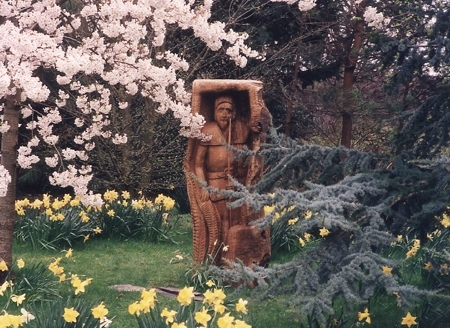 The Classical Garden has an arrangement of columns in one corner, various stone urns and a sculpture recalling Roger Lancelyn Green’s Tales of the Greek Heroes and The Tale of Troy. 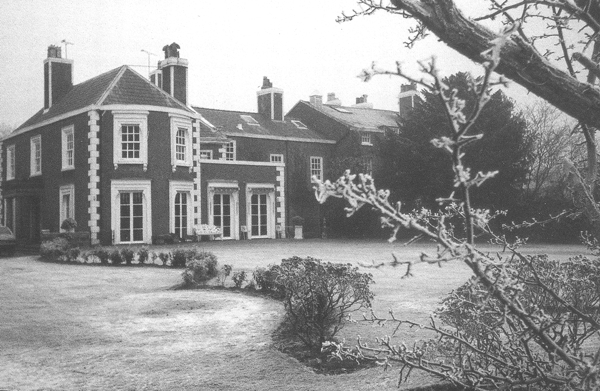 The fine sundial, which is as old as the building and which has always stood on the same site, is in the centre of the large garden. 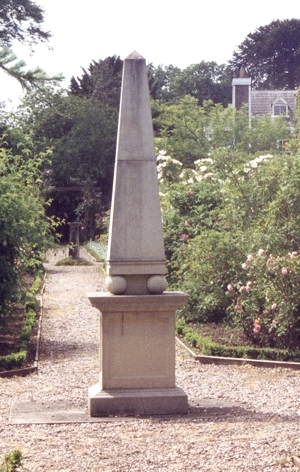 An Egyptian obelisk recalls Roger Lancelyn Green’s Tales of Ancient Egypt. 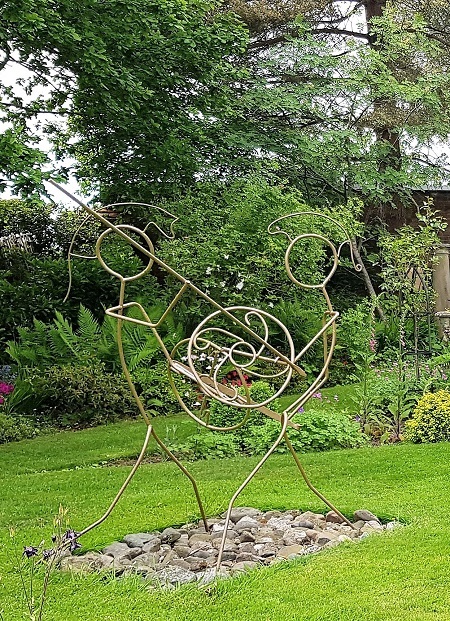 In the centre of the Rose Garden, surrounded by paths of Westmorland slate, is The Singing Rose (2003) designed and made by Cilla West, daughter of June and Roger, to commemorate his first published work, The Singing Rose and other Poems (1947). 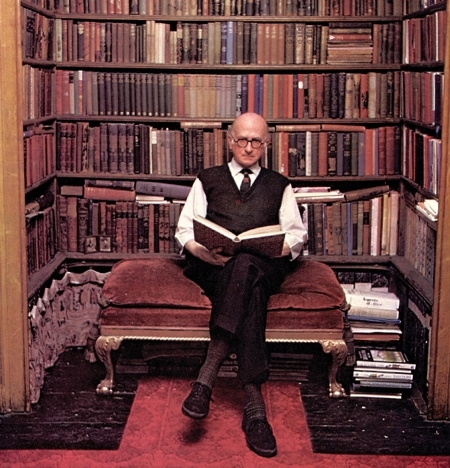 Roger Lancelyn Green excelled at telling stories. Jim Heath’s carved beech statue of Robin Hood, with his bow of yew, recalls his still-popular, and much translated, The Adventures of Robin Hood. 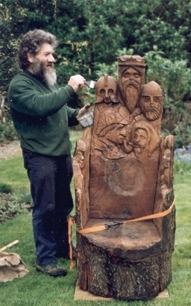 Jim’s intricately carved Storyteller’s Chair incorporates Alice, King Arthur, a Greek and Trojan, Sherlock Holmes, Mowgli and others. It is based on the bookplate designed for Roger by Pauline Baynes, who illustrated the Narnia Chronicles of C. S. Lewis. 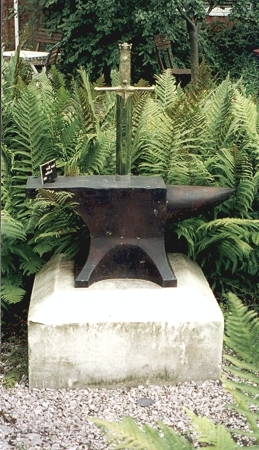 The Sword in the Stone was made by Sean Rice, now best known for his Stations of the Cross for the Metropolitan Cathedral in Liverpool. Roger Lancelyn Green’s King Arthur and his Knights of the Round Table is his most popular work, still in print and translated into many foreign languages. 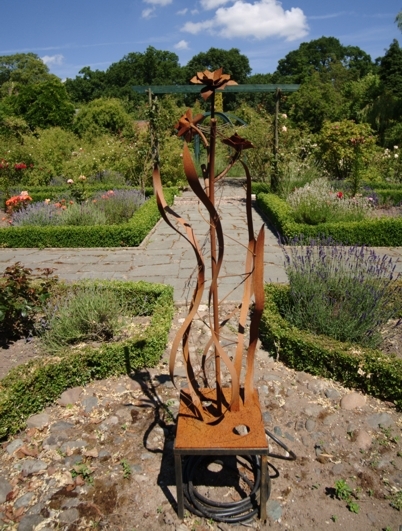 These are just a few of the artworks and items of interest in the gardens. In the Japanese Garden the volunteers have been influenced by the ancient traditions of Shinto and Zen gardens and inspired to create their interpretation. The Japanese garden tradition grew from Shinto symbolism. The Shinto religion had an empathy with the forces of nature, the seasons and the landscape. Water was a purifying agent. Later, there were the gardens of Zen Buddhist temples where the Karesansui style of dry landscape gardening developed. Here the presence of water is suggested by rocks and gravel arranged to symbolise seas, islands, mountains and rivers. Cherry blossom, azaleas, camellias and bamboo represent the acceptance of the natural cycle, in contrast to the seemingly never-changing character of the rocks. Other plants to note are the Heavenly Bamboo (nandina domestica) and Fatsia Japonica, often found amongst the greenery of Japanese Gardens. 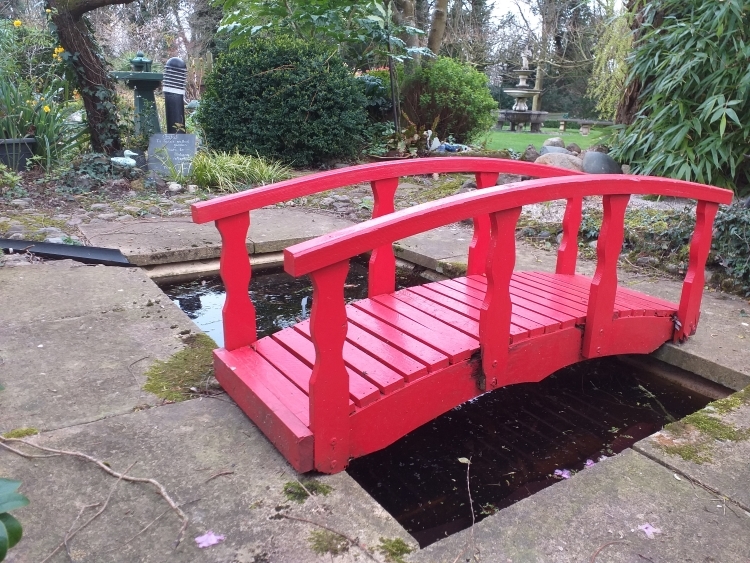 The bridge is red, an irresistible Chinese influence, , wonderfully vibrant in winter frost. A stone lantern recalls the lights in the ancient tea gardens. There are three stone basins. Two hold miniature landscapes and the third represents the traditional water basin, where guests would rinse their hands in a ritual ablution. 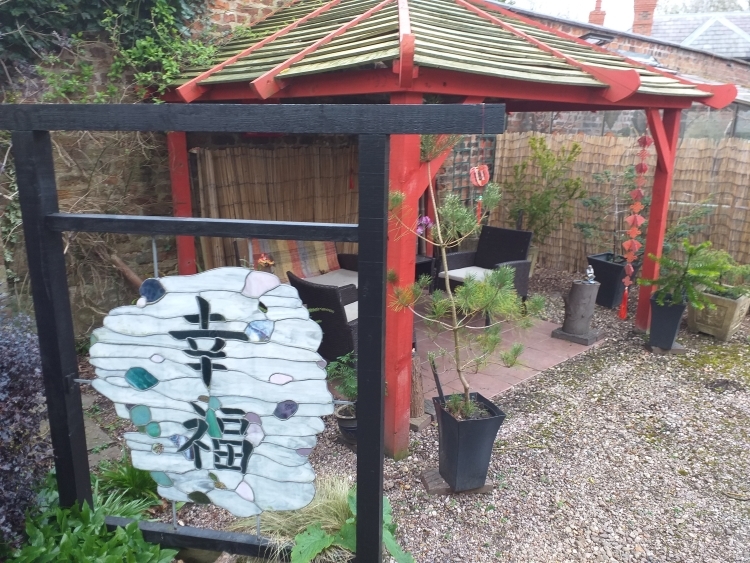 Chinese and Japanese traditions have influenced the volunteers in creating the garden, but they have also expressed themselves. They hope visitors will look at the rocks and gravel and imagine timeless landscapes on a grander scale, as they do, and find some pleasure or contentment there.